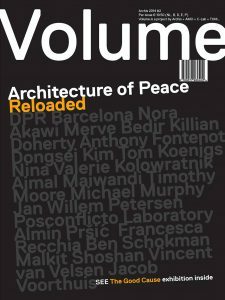 Four years ago, »Volume 26: Architecture of Peace« explored the agency of architecture in post-conflict environments, presenting a tense and complex issue with no clear solutions. »Volume 40« returns to the battleground, zooming in on the period directly after peacekeeping forces arrive. The goal is to see what a ‘reconstruction mission’ actually is, how peacekeeping can anticipate its legacy, and how different cultures come with different solutions to build or maintain peace. Re-building after war, it would seem, is another battle altogether. The issue »Volume #40« features the catalogue to the exhibition »The Good Cause«. The publication is only available in English.